English: Unknown woman as Ceres. Marble, Roman artwork, ca. 235 - 250 CE. 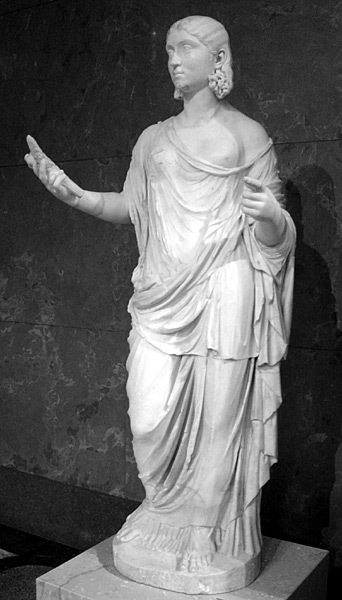 A talk-page comment on the en-wikipedia Ceres article states this as the portrait-statue of an unknown woman, not an image of the Goddess Ceres. The Louvre website describes it as an an unknown woman as (thus, with the attributes of) Ceres. See Louvre catalogue for details. Français : Femme inconnue en Cérès. Marbre, œuvre romaine, vers 235 - 250 après J.-C.
Hierdie lêer is gelisensieer onder die Creative Commons Erkenning-Insgelyks Deel 3.0 Onoorgedraagde lisensie. Subject to disclaimers.